September is here, summer is slipping away, and most of the students in the U. S. are beginning the new school year. As promised, I am beginning a first-of-the-month post of creative activities focused on families–after all, we can’t have all our fun in the summer! Many of the activities will be appropriate for school as well–in this case, for students ranging from preschool to college and subjects from art to Isaac Newton. In Michigan, September is the time of year we start to think about apples. This year the drought has made our apples few and far between, so we appreciate them more than ever. So, here are five apple activities for a few minutes of creative fun amidst the busy back-to-school days. If you have lots of crisp apples in your part of the country, consider them a treasure! 1. Have an apple taste-off to determine your favorite varieties. Create a score sheet with criteria you think are important. Should an apple be crunchy? Sweet? Not too sweet? Be sure to leave room for comments. Wine and chocolate tasters have specific vocabulary to describe the aroma, texture, and taste of those foods. What words will suit your apples? Cut the apples into wedges and start sampling. 2. 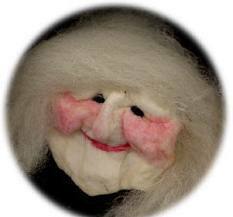 Make a dried apple head for a doll or puppet. This will work best if you live in a drier climate or have a dry airy place to safely store your apples for a few weeks. Make several and try to predict what they will look like when they dry. They may surprise you! 3. Try some apple experiments. 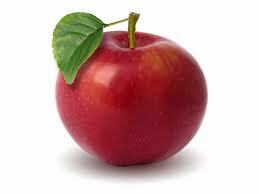 Try this experiment to see how you can best prevent an apple from turning brown. Once you’ve done that, invent your own experiment. Based on your results, what else might help apples stay white? Try several ideas and see what happens. Or make an apple mummy. Who knew such things were possible? 4. Here’s a quest for older students (not to mention interested adults). Have you heard the story of Sir Isaac Newton sitting beneath a tree until a falling apple hit his head, presumably spurring his theories about gravity? It appears there is some fact beneath the story. Go to the Royal Society Library’s Turning the Pages exhibit and look for Memoirs of Sir Isaac Newton’s Life. It may take a bit of experimenting to find which viewer works best with your system, but you should be able to page through the manuscript until you find the account of the story (helpfully marked by the library staff) and click to enlarge it. It takes some concentration to master the handwriting, but it is fascinating to read as close to a first-hand account as we have. Perhaps it will inspire you to try some experiments with gravity. These are fun, as they feature clowns that refuse to do as expected. 5. 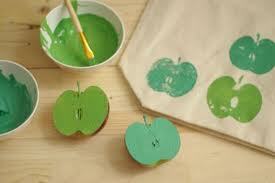 Make some apple prints. You can have fun printing on paper, or get some fabric paints and try printing on a tote bag, t-shirt, or napkins. Experiment with other fruits or vegetables. What combinations are most interesting? Bonus idea: One of my favorite fall snacks is raspberry applesauce, made by combining apples, raspberries, and some apple juice concentrate for sweetness. Yum! What other fruits could you mix with apples to make delicious treats? 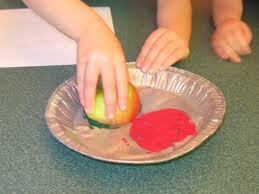 What other apple activities might be creative fun for fall? Anyone have favorite apple stories?